For the first time in any poll the combined CDU/CSU and SPD total falls below the level needed for an absolute majority, with the CDU down to just 30.5 per cent of voting intentions and the SPD touching a new record low 17 per cent. The populist Alternative fuer Deutschland (AfD), anathema to both of the traditional leading parties, scores 15 per cent, its best result in an opinion poll since last September’s Bundestag election and its highest with INSA since January 2017. For the first time with any pollster the gap between the SPD and AfD is down to a mere two percentage points, raising the real prospect of the AfD moving into second place in the opinion polls. This would greatly strengthen its ambition to be the country’s primary opposition force. 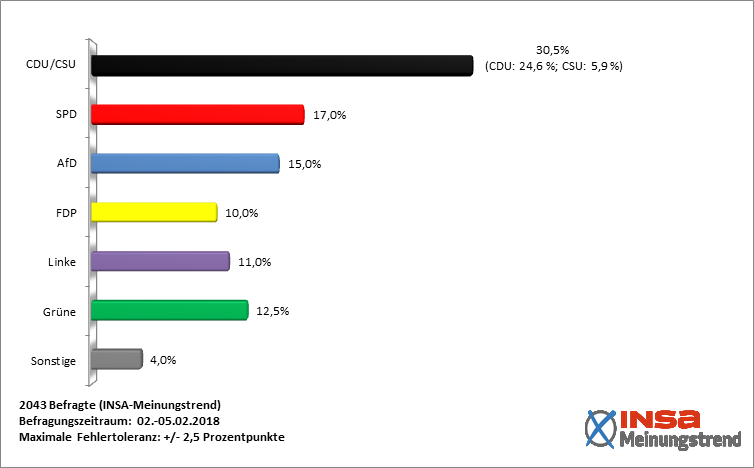 This INSA survey may turn out to be an outlier and certainly this poll puts the SPD below others published recently, which have given Martin Schulz’s party between 18 and 21 per cent. Equally the AfD has more typically scored 13 and 14 per cent in polls released during the last ten days. On the other hand more difficulties may lie ahead once the full terms of the Grand Coalition deal are published, including many compromises that may alienate both CDU/CSU and SPD supporters – and there is also the tricky hurdle for the SPD leadership of gaining approval for agreement in a nationwide ballot of 450,000 party members. While it is the SPD that appears the most fragilised by the current political situation, a sharp drop of three points in a week for Angela Merkel’s party indicates that the centre-right is also facing tough challenges in retaining its support level. Fieldwork: 02.02-05.02.2018. Released: 06.02.2018. Participants: 2043. Method: Online poll. Media partner: Bild. Visit the Insa website here.